Does your denture hold poorly? Don´t you want to use adhesive cream? Gain a self-confidence, use our mini-implants! 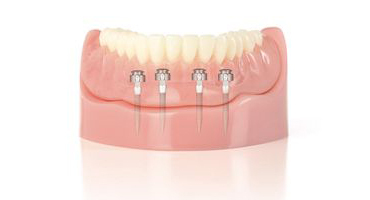 Have you got removable partial – total denture? Does it hold poorly and forces you to forget about any hard food and to eat soups and soft food only? Are you tired of the taste and the feeling of adhesive cream on you denture in your mouth? You do not want to or you can´t use common implants? Various adhesive creams holds the denture for some time, however you have no assurance that it doesn´t fall out at inappropriate moment. Do you want to gain self-confidence and not to limit your social and work life? We have a solution for you! Mini-implants will help you! 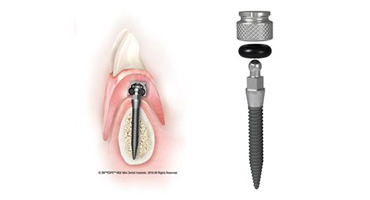 Dental mini-implants are implanting screws of a small diameter (1,8 mm), made out of titanium. They have much smaller diameter than common implants and it is much easier and faster to place them. A small hole is drilled and mini-implant is “screwed” into the bone. Process is done under local anaesthesia only. Small balls are then visible in your mouth, where the mini-implants are. You denture, which is now equipped with fitting sockets, is then “clicked” on the balls. The placement and aplication of mini-implants is cost and time friendly, in comparison with normal implants. Your dentist decides the exact placement of mini-implants based on entry examination and X-ray image. There is no surgery needed while placing the crews into the jawbone, only local anaesthesia. 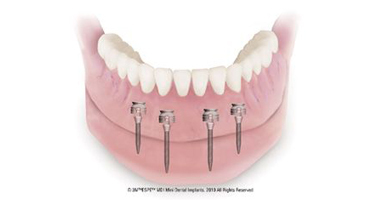 4-6 mini-implants are usually enough to ensure proper support of the denture. Mini-implants are successfully used for more than 20 years in USA and in Europe. This method is more and more popular and is required by patients in more than 60 countries across the world. We use 3M ESPE mini-implants, made in USA.